From the earliest Christian community (Acts 6:1-6) to the present, deacons have played an integral part in the life of the Church. Perhaps not as visible and prominent as they once were, the ministry of the diaconate is an integral part of the Church’s ecclesial identity, being one of the three ordained offices of the Church. As the name implies (διάκονος = “servant”), the diaconate is the office of service par excellence, and the deacon serves at the behest of the local Metropolitan both liturgically and pastorally in the life of a community. 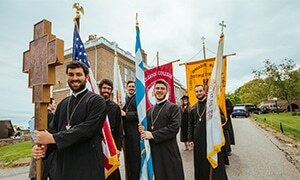 Through an intensive mentoring program, distance learning offerings, and three summer sessions on the campus of Holy Cross, the Diaconate Program introduces students to the theology, history, liturgical practices, pastoral approaches, and canonical tradition of the Orthodox Church. The program provides students with a cohort of like-minded individuals seeking to prepare themselves for service to the Church. The on‐campus certificate program is designed to prepare a candidate for the ordained diaconate. The candidate must be a committed and mature Orthodox Christian who has been active in a parish, and who senses a calling from the Lord to serve the Church in the diaconal ministry. The program is the basis for other meetings and studies required by the local Metropolitan, and complemented by service in a parish under the mentorship of the local priest. The program is designed especially for persons who are members of the Greek Orthodox Archdiocese of America and who have the blessing of their Metropolitans to participate. Persons from other Orthodox jurisdictions may also apply to participate in the program. This program is not designed for persons who sense a calling to the priesthood. Students will receive a Certificate of Study from Holy Cross upon the successful completion of the Diaconate Program. Applicants should be aware that admission into and successful completion of the Diaconate Program is not a guarantee for ordination. It is understood that the Holy Synod will determine the final criteria for ordination to the diaconate and that diaconal assignments to a particular parish or ministry are made by one’s Metropolitan. Each of the four educational and formational components of the program has its own supervisory framework. Each Metropolitan is responsible for designating regional groups and convening educational seminars and workshops for his candidates. This process is intended to meet students’ intellectual, social, and emotional needs. In smaller geographical areas, there may be a need for only one regional group to meet periodically at the Metropolis center. For larger Metropolises, multiple regional groups may be needed. The number and organization of regional groups and the frequency with which they meet is at the discretion of the Metropolitan. Each group provides an organizational framework wherein specialists, theologians, and local clergy work together to reinforce and enhance understanding of core topics and skills proficiency. The Clergy Mentor is responsible for individual guidance on the parish level in the areas of liturgical practice, pastoral activities, and parish administration. The mentor is the person through whom the local cluster communicates with their respective Metropolitan and the faculty of Holy Cross. While the mentor works as an enabler rather than informer, he is also responsible for training future deacons as to how they will conduct their liturgical responsibilities. In addition to the above requirements, once a student has been admitted to the program, the student must meet the requirements of the Greek Orthodox Archdiocese in terms of psychological testing and evaluation during the first year of his enrollment in the program. Deacons and candidates are afforded opportunities to continue their education and spiritual growth, as well as their service to their parish and community. In addition to the one-time $75 application fee, students are required to pay tuition of $1,350 for each nine-day summer session they attend. This cost includes housing and meals as well as instructional fees.